There are so many unique and magical things to do in Heidelberg, Germany! Heidelberg was the last stop on our European jaunt where we visited cities in France, Switzerland, and Germany. While it’s too hard to pick favourites, a part of me thinks that we left the best city to last. It’s easy to fall in love with enchanting, romantic, beautiful Heidelberg. Before I get into specific things to do in Heidelberg, let me tell you a little bit about this German city. It’s a university town on the river Neckar in southwest Germany. About 1/4 of its population are students, reminding me a little bit of Tübingen, a smaller town we visited prior to Heidelberg. 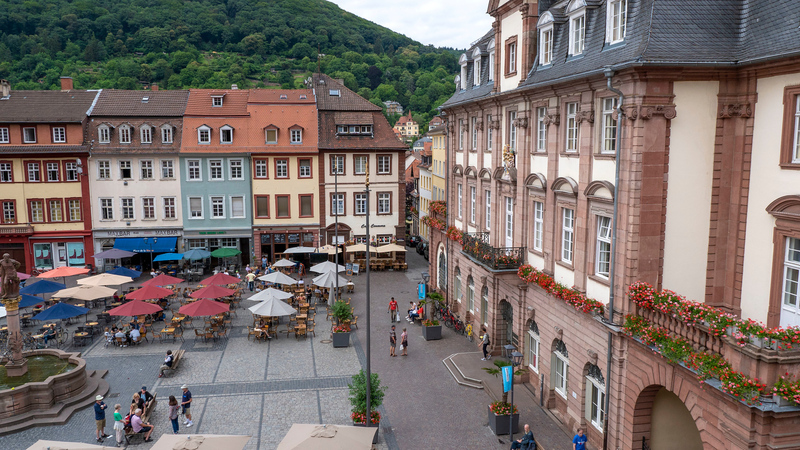 Tourists flock to Heidelberg because it has a charming old town, a rich history, and a stunning landscape. However, I’m going to show you what to do in Heidelberg that’s both on and off the typical tourist radar. 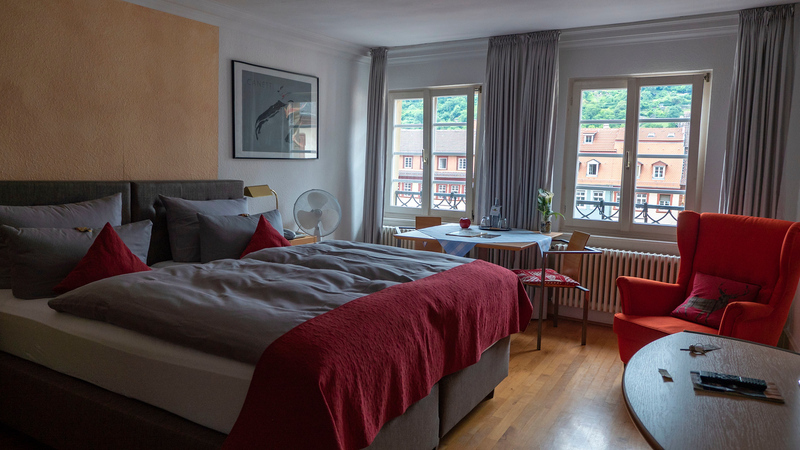 Justin and I stayed in Heidelberg for two nights, but you could easily stay longer. 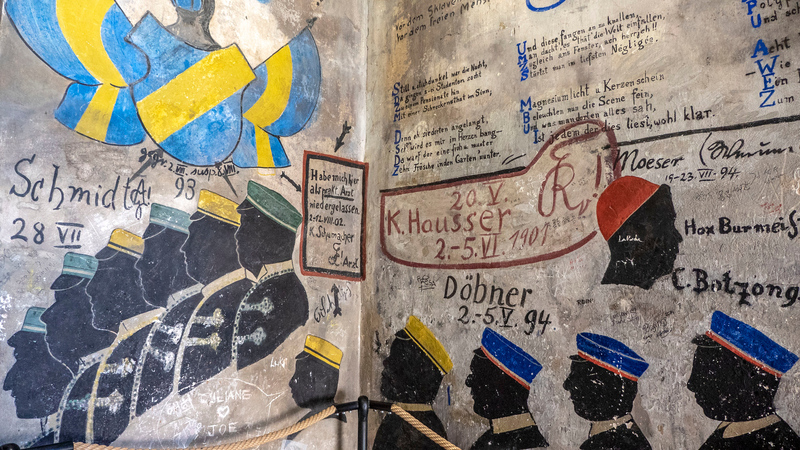 Even if you only have a day in Heidelberg, you’ll be able to check several things off this list. We were left wanting more and we’ll hopefully return soon. It was named as the UNESCO City of Literature in 2014. 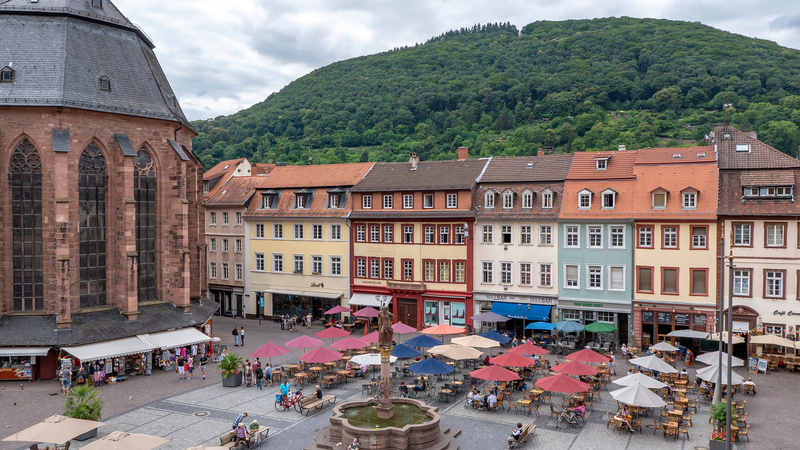 There are libraries and bookshops at every turn, a literary festival each summer, and literary award winners continually coming from Heidelberg. Heidelberg is a city for literature and book lovers! There are events for every interest throughout the entire year. When you visit, there’s an excellent chance that there will be a festival. Some popular events include a Vampire Ball in February, the Heidelberg Spring Festival (an international music festival), Heidelberger Schlossfestspiele (Castle Festival), the Old Town Festival in September (live music, an artisan market, and biggest festival in the Old Town), Enjoy Jazz Festival, the Heidelberg Christmas Market, and so many more. 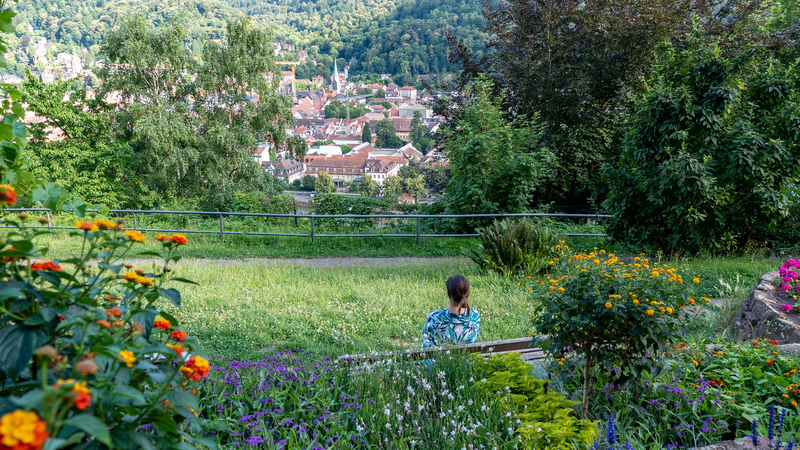 Heidelberg is one of the warmest places in Germany, so plants that are not typically able to thrive in central Europe can grow there. Almond trees, fig trees, and even olive trees can grow in Heidelberg. It’s part of the southernmost wine region of Germany called Baden with an ideal climate for growing a variety of grapes. Furthermore, you receive a discounted price on several sightseeing tours, walking tours and a segway tour. You’ll also get discounted tickets to several museums and performances, discounts and freebies at selected restaurants and shops, and discounts on several boat trips. 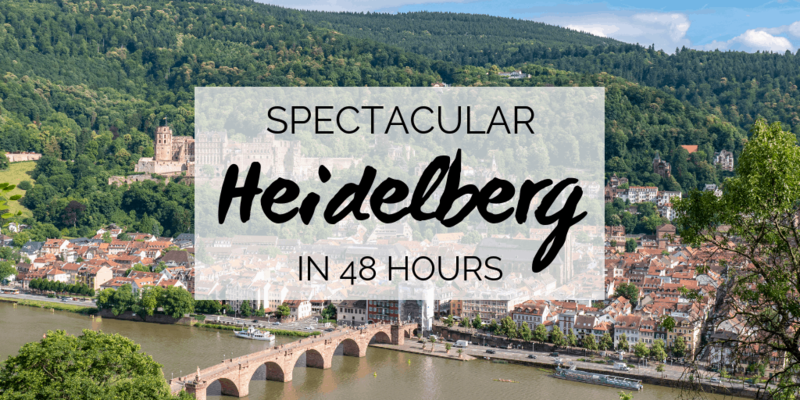 Now, let’s get to the actual list of things to see in Heidelberg that we personally experienced and loved. The Philosopher’s Walk (Philosophenweg) is a walking trail that must be included on any Heidelberg itinerary. Even if you’re only spending 1 day in Heidelberg, I highly recommend that you take this scenic stroll. It’s one of the most stunning panoramic walks in all of Germany and Europe. Hike on this paved path that meanders up the hill. Then, the path runs parallel to the northern banks of the Neckar River. We started the walk at the Alte Brücke (Old Bridge). Then, we climbed up the hill on a winding path called the Schlangenweg. Justin and I were treated to numerous views of Heidelberg Castle and Old Town as we ventured to the top. Next, the path flattened out and we leisurely walked with spectacular views on the way. Eventually, we stumbled upon the Philosophers’ Garden where we took a little rest on some park benches, surrounded by beautiful flowers. This famous path was once the source of inspiration for scholars and great minds, and we hope that it provides you with a little bit of inspiration, too! 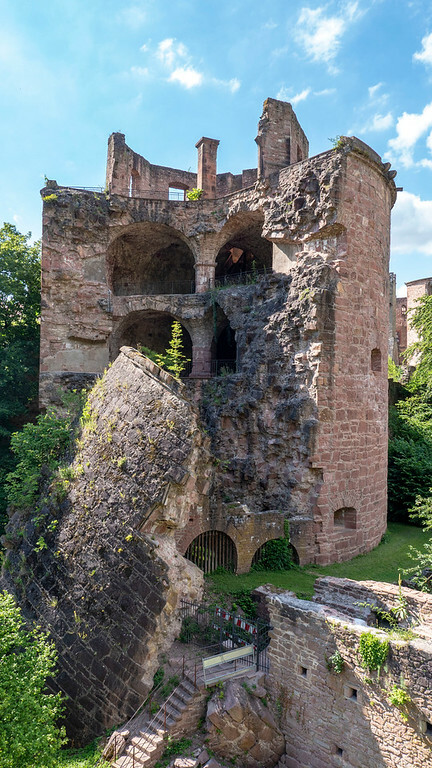 The romantic Heidelberg Castle is the most famous attraction in Heidelberg. You simply must visit when you travel to Heidelberg. These medieval castle ruins sit on top of the hill overlooking the Old Town. While the construction of the castle started in the early 1200s, it expanded over the centuries to have several structures, fortresses, towers, moats, and gardens surrounding the complex. Ravaged by wars, fires, and two lightning strikes, it’s still an impressive sight to behold and explore. 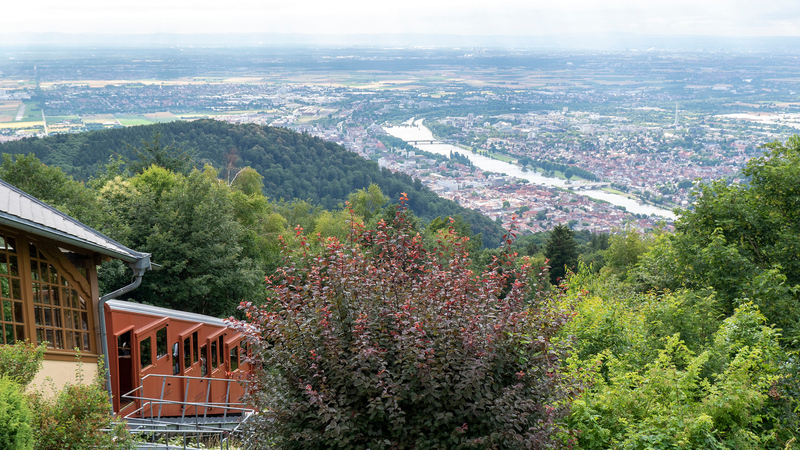 Take the funicular from Kornmarkt to the first station stop at Heidelberg Castle. From there, wander around the castle ruins and grounds. 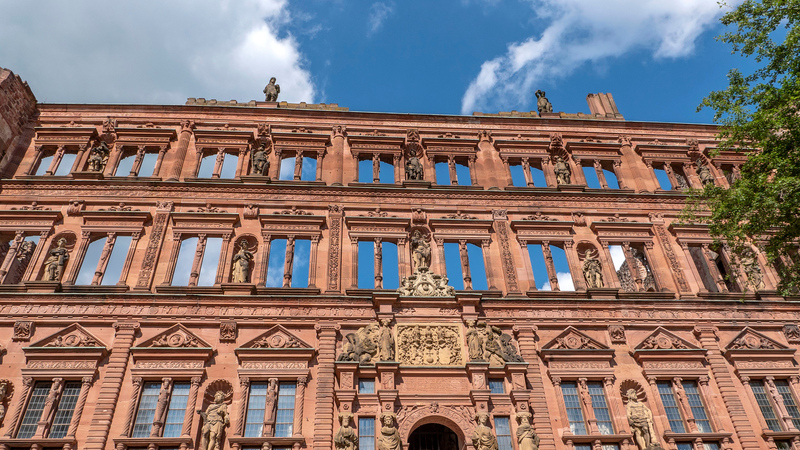 The Ottheinrich Building is one of the earliest palace structures with sculptures adorning its facade. It’s the first castle in Germany to have elaborate decorations on the exterior of the building. Now for one of the most unique attractions in Heidelberg, the gigantic wine barrel. 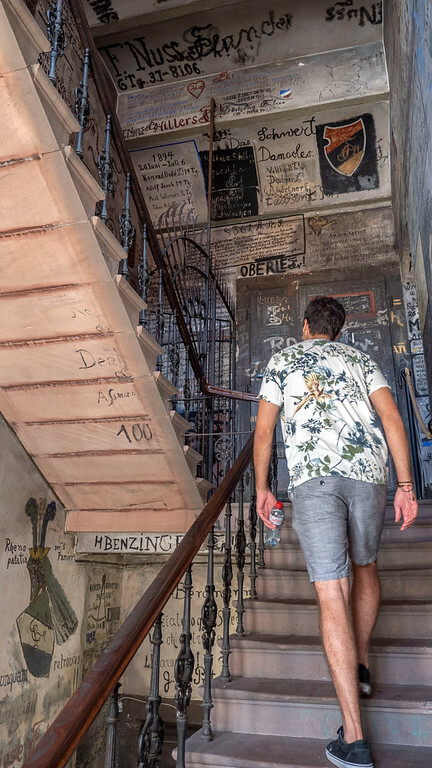 Walk inside the Barrel Building (Fassbau) to marvel at the Great Heidelberg Tun. 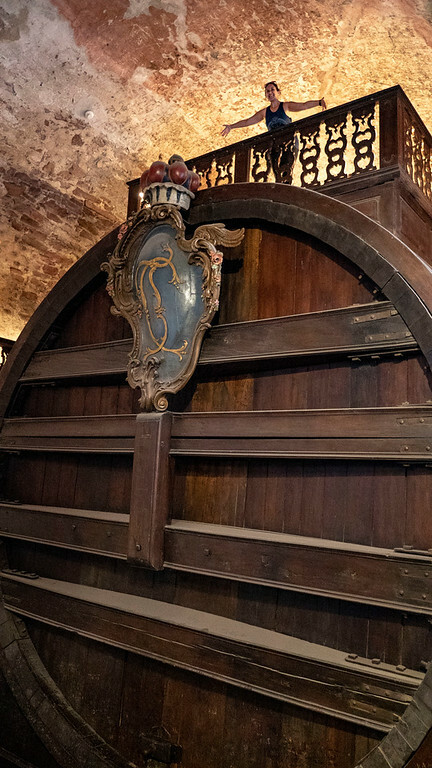 Back in 1751 when it was constructed, this wine barrel could hold 221,726 litres of wine. It took 130 oak trees to build it. As you can see from the photos, this wine vat is so massive that a balcony/dance floor was built on top of it. Rarely actually used as a wine barrel, it’s used mostly as a tourist attraction. Justin and I walked around the rest of the property, discovering old castle ruins overgrown with ivy. Then, we made our way to the other side of the castle where we could admire beautiful views of the city from this fortress. For castle ruins, many portions were still extremely in tact, while others were gradually being reclaimed by the earth. 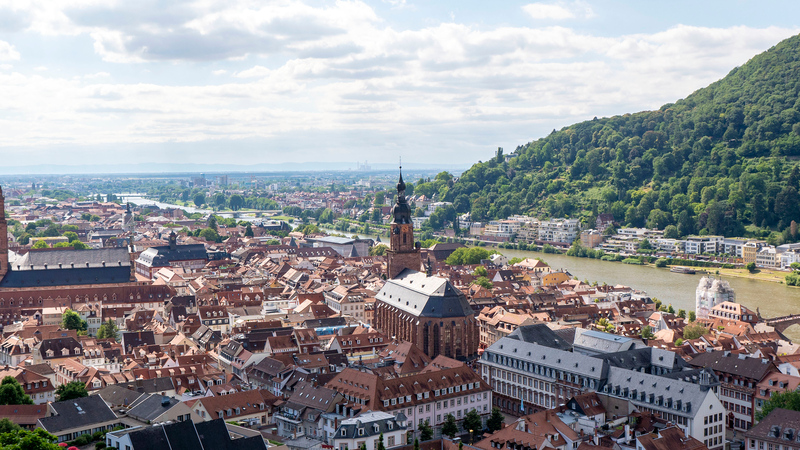 It’s a very fascinating place that easily tops the list of things to do in Heidelberg. 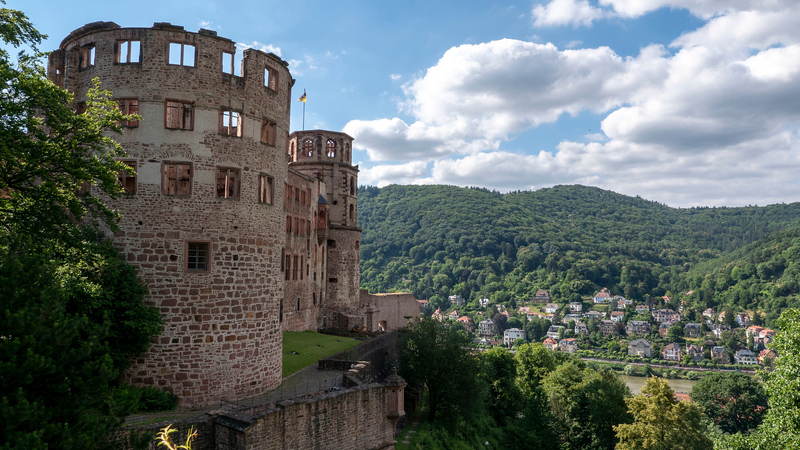 From Heidelberg Castle, purchase a separate ticket to the Königstuhl summit. It’s very interesting to travel on two different funicular tracks to reach the top. 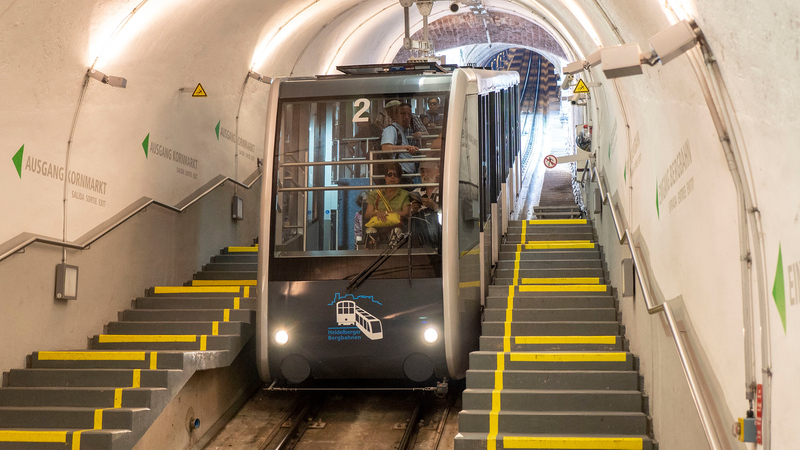 The first tram in the lower portion transports you from the base of the mountain to Heidelberg Castle and then to the Molkenkur transfer station. You have the option here of disembarking and hiking your way up to the Königstuhl summit, via the Stairway to Heaven trail. We decided to take the more leisurely mode of transport and switch to the upper section of the funicular. 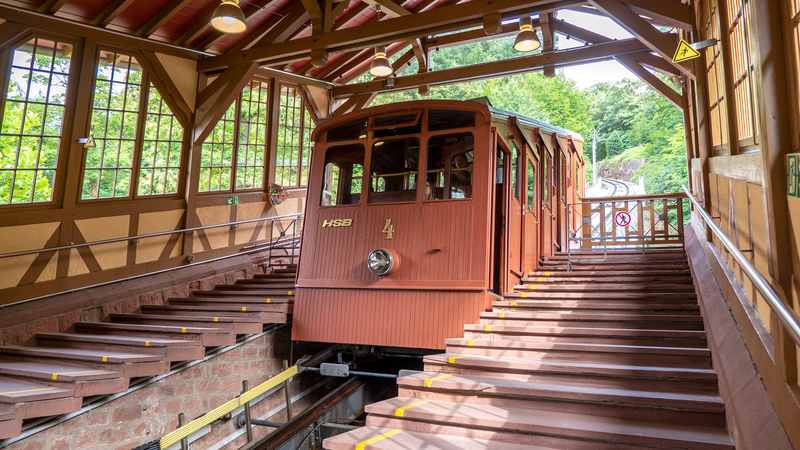 These funicular cars are wooden, modeled and rebuilt after the original ones dating to 1907. The Konigstuhl is 568 metres high and it is the highest peak in the Lower Odenwald forest. 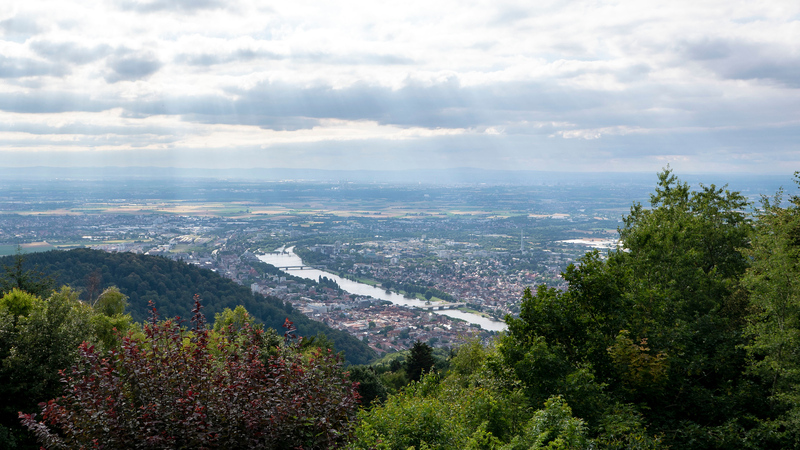 From here, enjoy wonderful scenery over Heidelberg, the Neckar River, and the Rhine valley. You can even see as far as Alsace on a clear day. Not many tourists ventured up to the top of the mountain with us, making it a very tranquil and quiet place. Justin and I were fortunate to stay right in the middle of the Historic Market Square (Heidelberger Marktplatz), so we spent quite a bit of time in the Old Town (Altstadt). After all, one of our favourite things to do in Heidelberg was to explore by foot. I’d never grow tired of the rows of colourful houses, intricate and detailed architecture, and a seemingly infinite amount of alleyways to poke my head down. 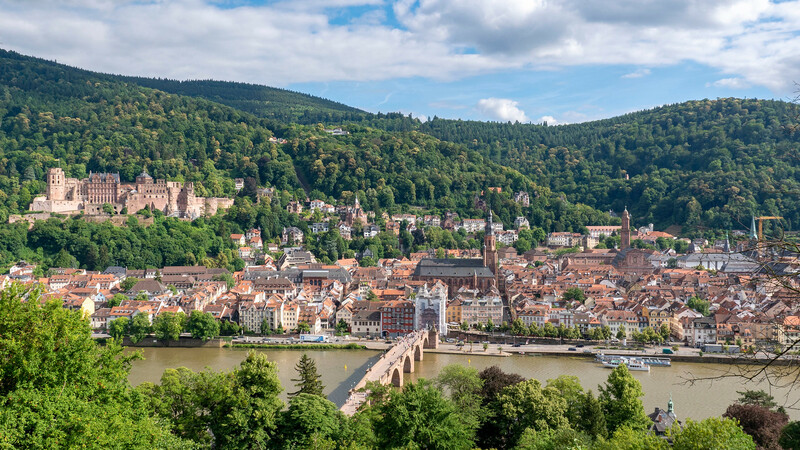 Heidelberg’s Altstadt is on the southern banks of the Neckar River, dominated by the Hauptstrasse (Main Street), a mile long pedestrian street. The Hauptstrasse runs the entire length of the Old Town. Be sure to check out the Alte Brücke (Old Bridge), built in 1788 and the ninth bridge on this site. 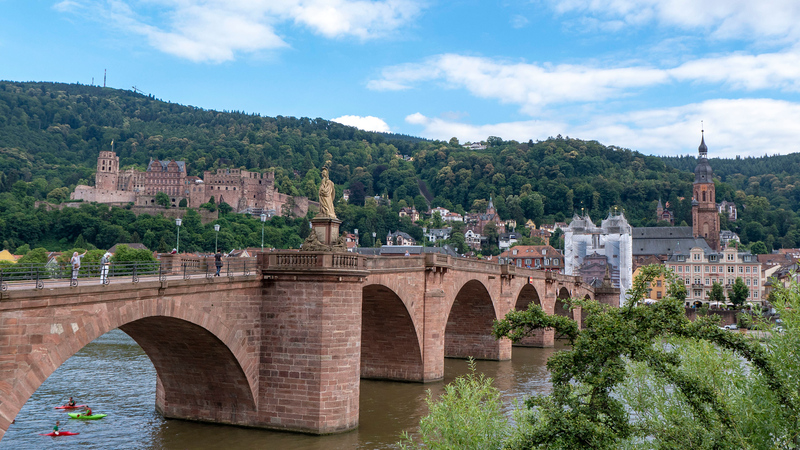 While the first mention of a bridge near Heidelberg was constructed by the Romans in the 1st century CE, the first bridge known to be in the place of the current one was built in 1284. In the 15th century, there was a statue of a monkey holding a mirror on the Old Bridge, but it disappeared after the Nine Years’ War. 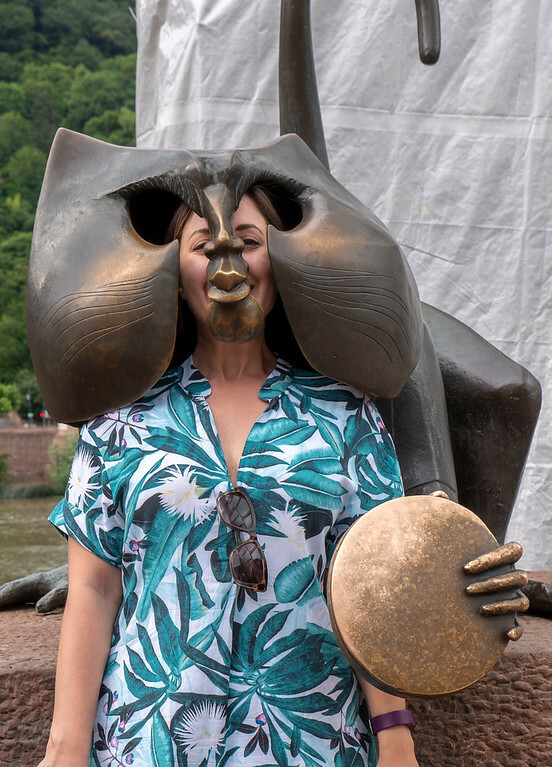 The current statue was erected in 1979 and tourists can position their head inside the monkey’s head. 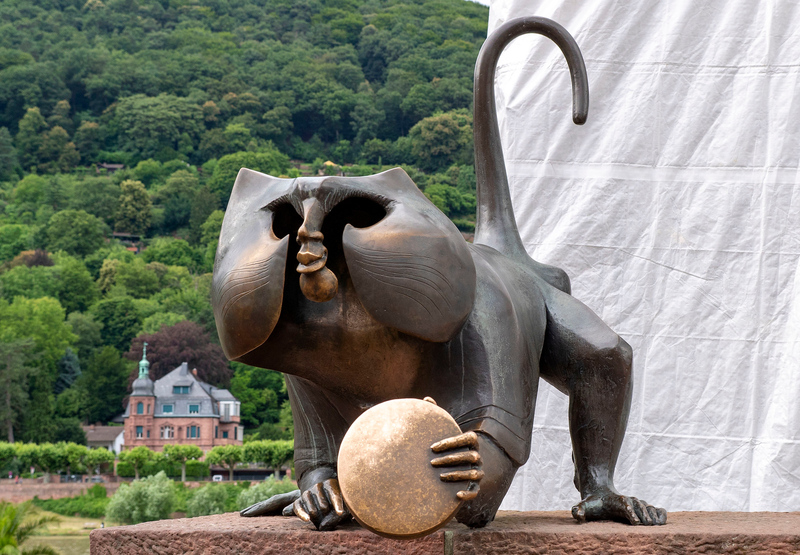 As legend has it, rubbing the monkey’s fingers guarantees a return trip to Heidelberg, rubbing his mirror bring good luck and fortunes, and touching the nearby mice brings fertility. 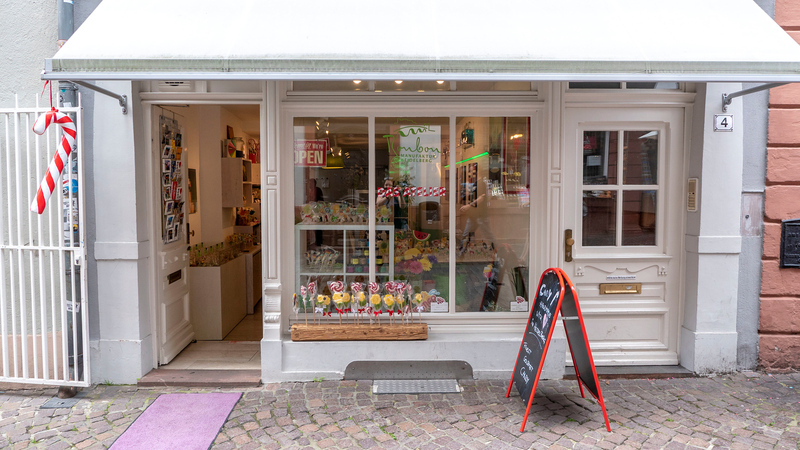 Heidelbonbon is a independently owned candy shop right in Old Town Heidelberg. 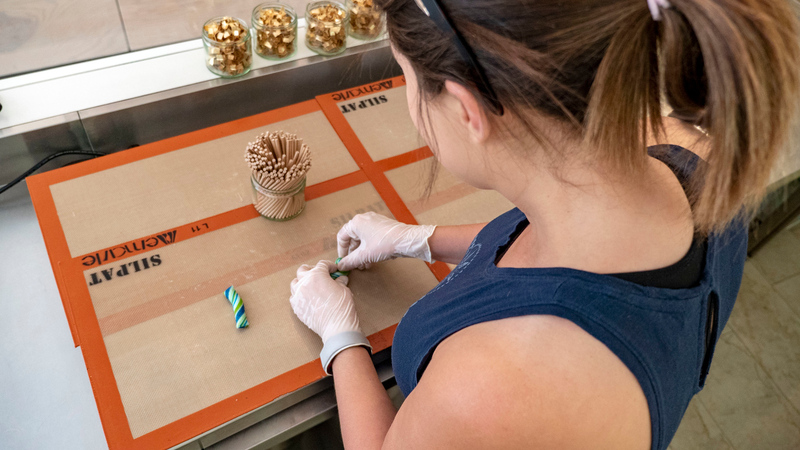 The candy is completely made by hand using traditional methods. 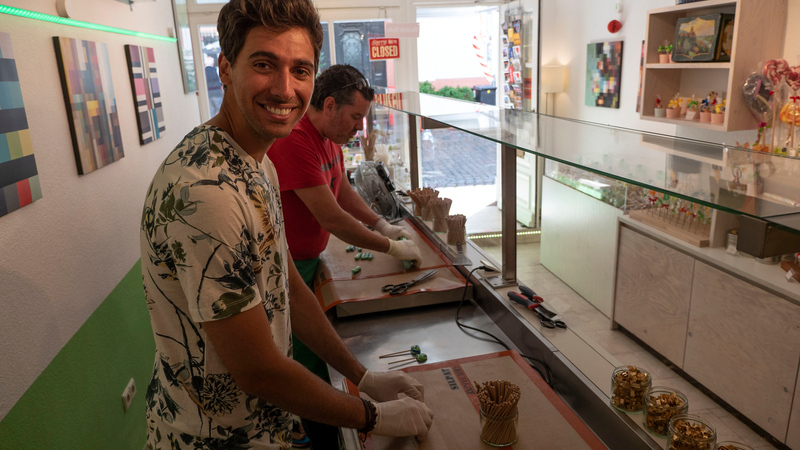 Justin and I were thrilled to have the opportunity to make our own candy, with the assistance of the owner. 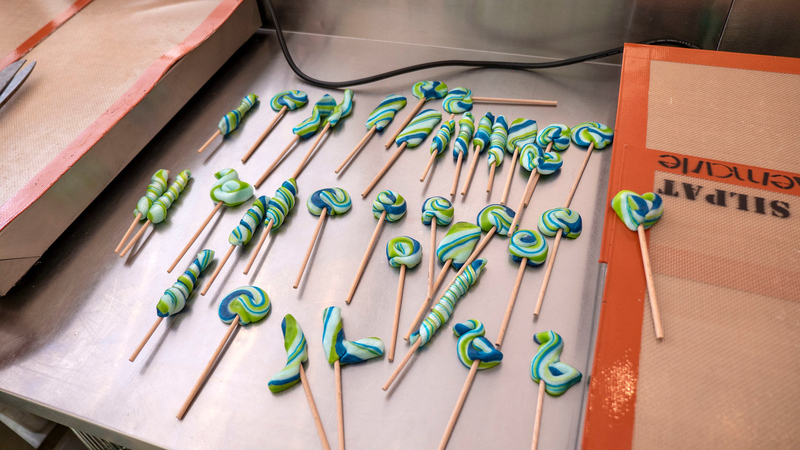 We chose the colour and flavour of the candy – blue and green with a watermelon taste. 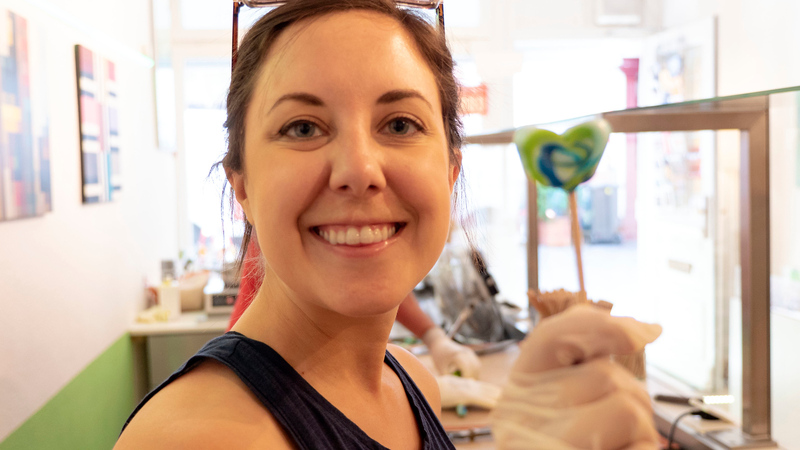 The owner showed us how to make the candy. It started as a boiling liquid and cooled into a softer, flexible texture that we could shape by hand. He cut off small pieces of candy for us to twist into lollipops on small wooden sticks. The candy hardened and we were left with a mountain of lollipops to take home with us. 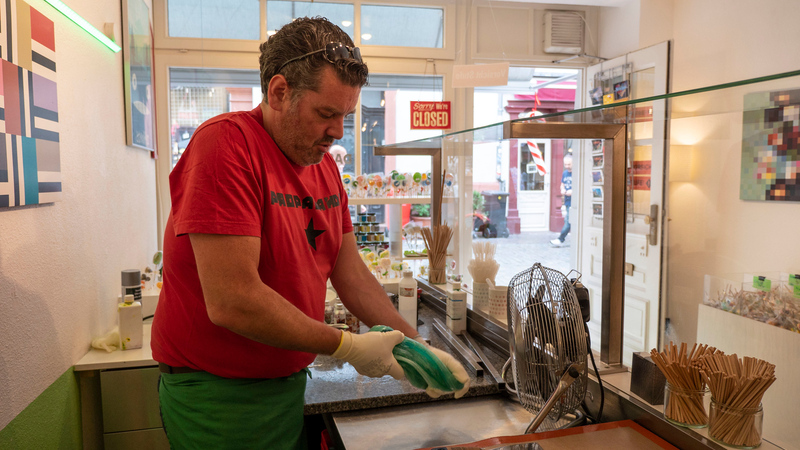 Whether you’re making candy or leaving it to the professionals, the candy at Heidelbonbon is absolutely delicious. The candies in the shop come in a variety of flavours, shapes, and sizes for many occasions. All of the treats in the shop are vegan, with the exception of red candy as it contains carmine. Our watermelon flavoured blue-green lollipops stained our tongues blue. After this fun experience, we felt like kids again! We giddily ventured back out on the town riding a sugar high. 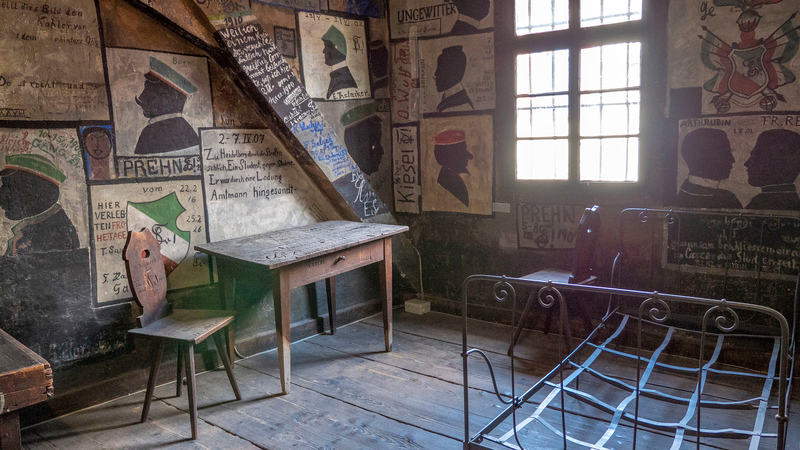 Here’s one of the most unique things to do in Heidelberg: pay a trip to the University of Heidelberg’s Student Prison (Studentenkarzer). Back in the 19th century, misbehaving students were incarcerated in the university’s student jail. From 1823 to 1914, students were imprisoned for any sort of bad behaviour, from alcohol fueled antics to insulting the authorities. University students back then were disorderly and rowdy at times, just as they are now. Some things never change! Those thrown into the student prison could remain there for two days up to four weeks, depending on the severity of their offense. In theory, they were still expected to attend their classes. There was a special entrance from the attic prison to the university buildings. 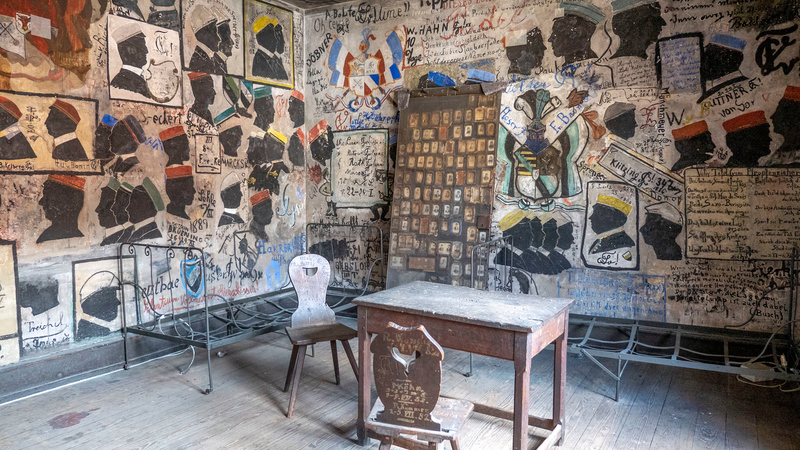 It seems as though most of the students spent their time drawing on the walls or ceilings of the jail. 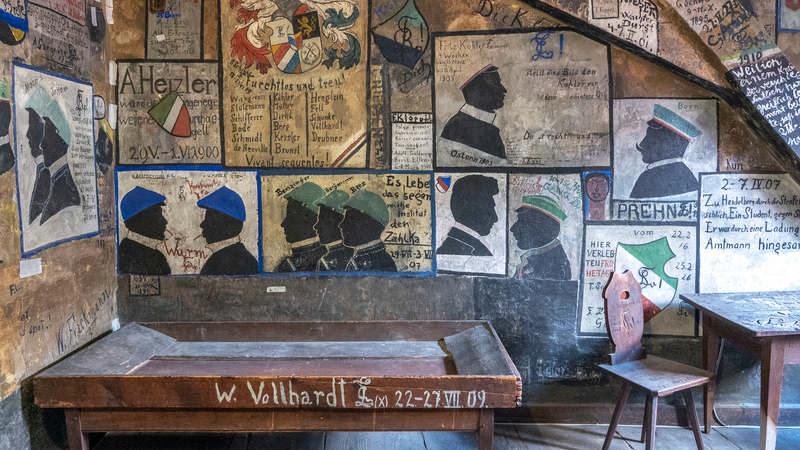 The graffiti ranges from cartoons, names, poems, family crests, and fraternity badges. 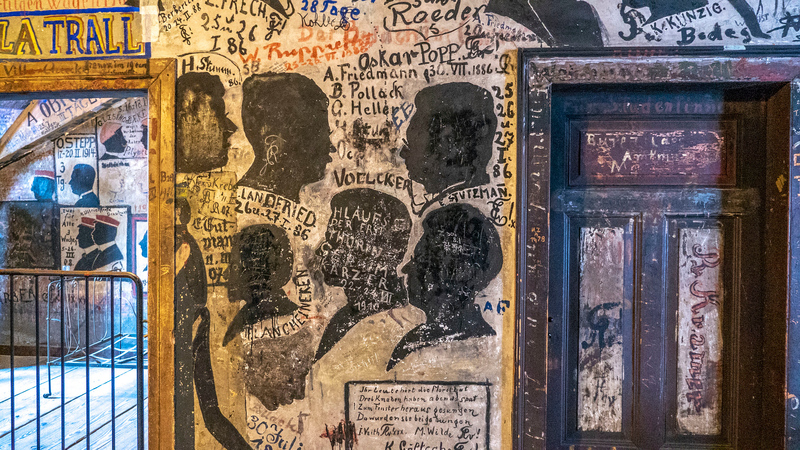 There are many black silhouettes of faces on these walls of the frat boys themselves. Entrance to the Studentenkarzer, University Museum, and Old Assembly Hall is €3, with a reduced price if you have a Heidelberg Card. 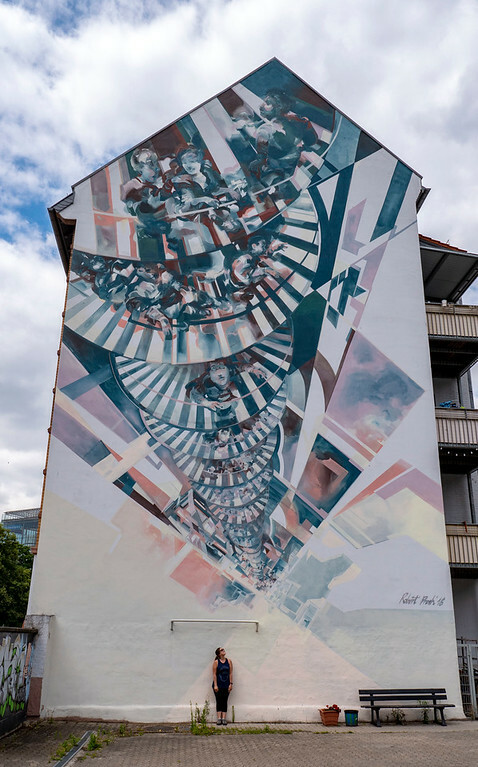 And from student graffiti to outdoor public art, let’s explore the beautiful murals on Heidelberg’s city streets. 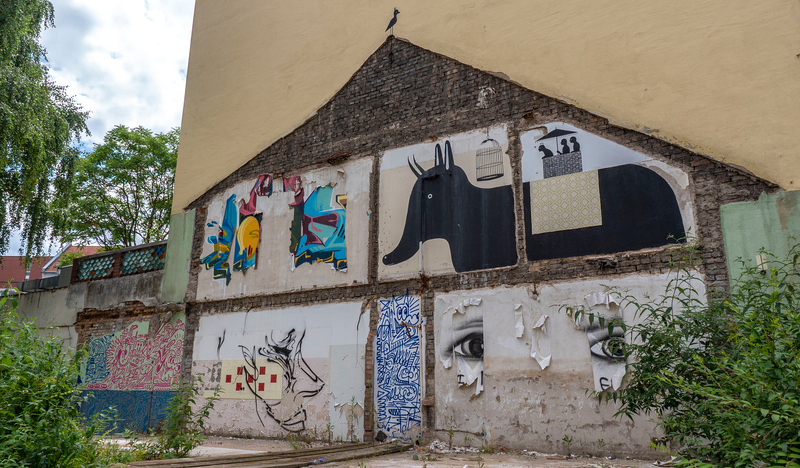 While so much of Heidelberg devotes itself to tradition and history, its street art shows a contemporary side to the city and its residents. Heidelberg is alive, changing, creative, and inspiring. Street artists transform plain and barren walls on the sides of buildings into elaborate works of public art for everyone to enjoy. 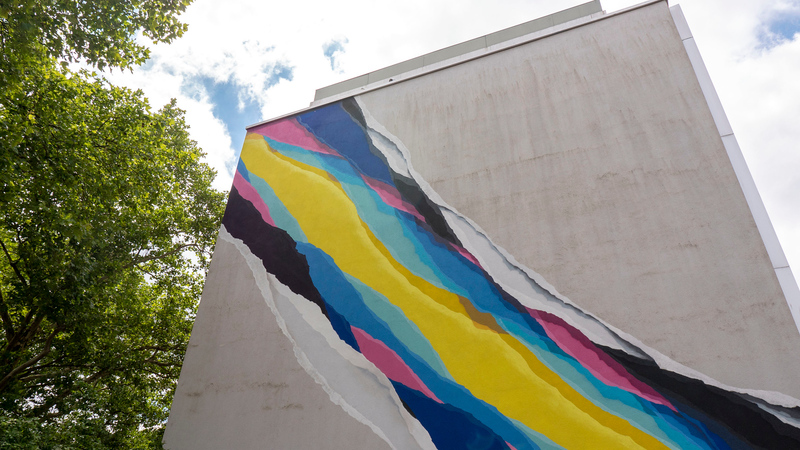 We met with Pascal Baumgartner to discover local street art in Heidelberg. He explained the complicated and at times, frustrating circumstances that it takes for an artist to gain permission to paint their murals. 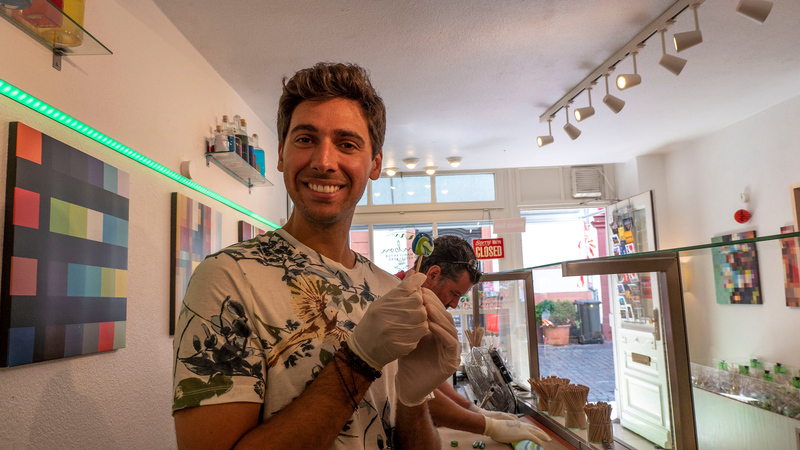 Thankfully, he has the drive and passion to attract artists to from around the world to create thoughtful works of art for everyone to enjoy. 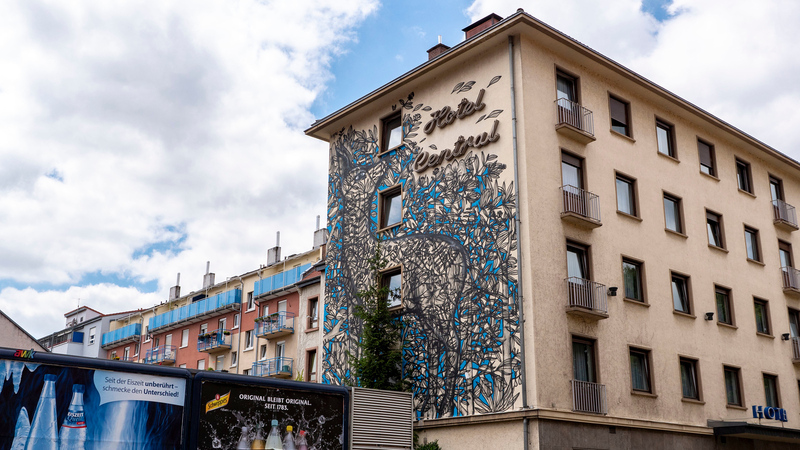 We were grateful that Pascal showed us a few of the brilliant and beautiful murals around town. We learned that we were visiting Heidelberg just a little too early to attend the Metropolink Festival in July. 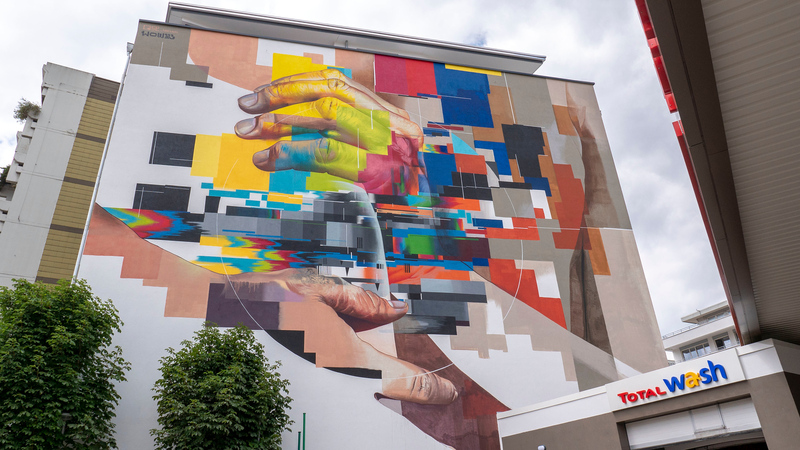 This festival celebrates urban art by inviting internationally acclaimed artists to create massive and spectacular paintings in Heidelberg. 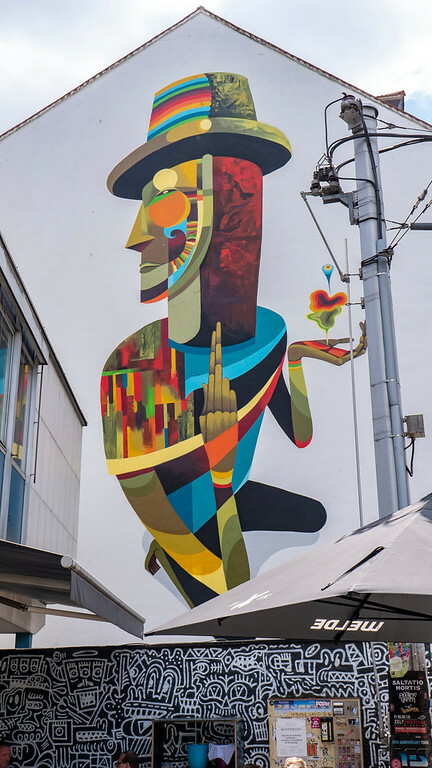 The city becomes a space for urban art as many walls are transformed, and everyone can watch the artists at work. 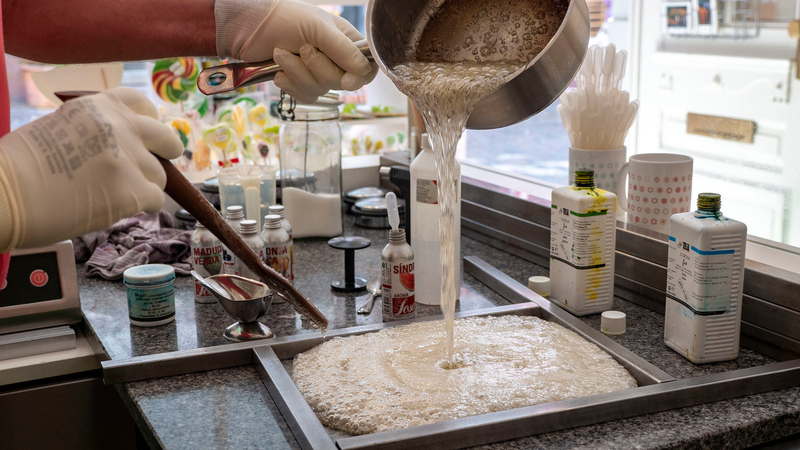 You can see many new creations from the summer of 2018 on the Metropolink Instagram page. Looking for a local brewery to taste a refreshing Bavarian pint? 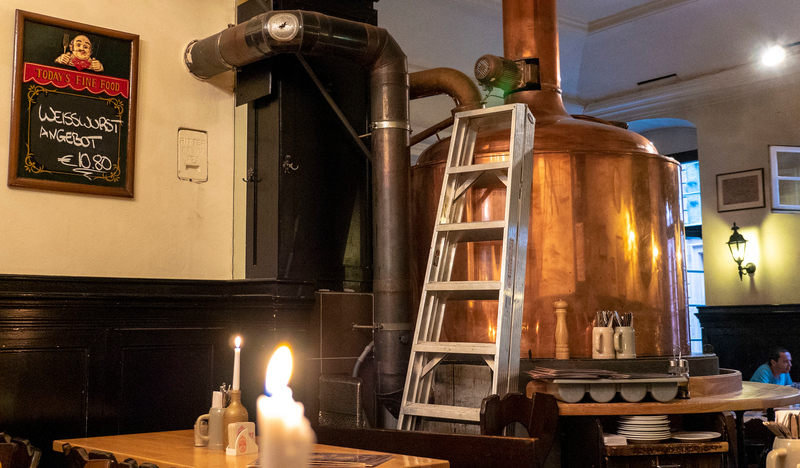 Vetters Gasthausbrauerei in Old Town Heidelberg is the most popular and renowned original brewery in town. According to the German purity laws, their beer only contains hops, malt, water, and yeast. 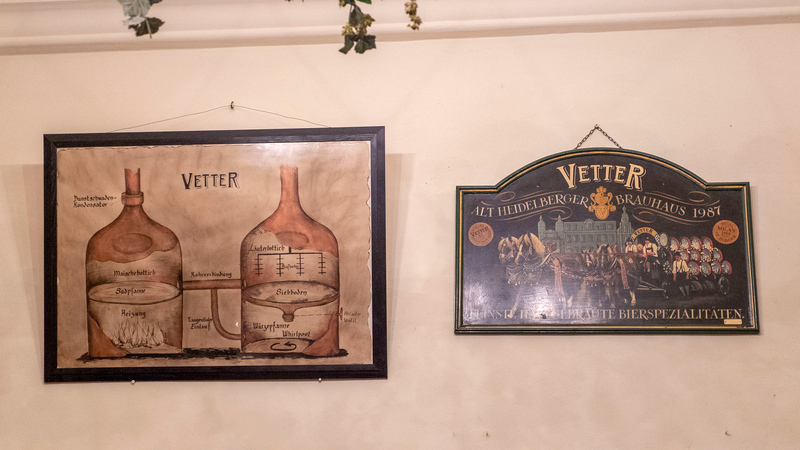 When we arrived at Vetter Brewery, it was packed. We weren’t sure that we could get a seat as both the patio and indoor restaurant looked completely full. However, here’s an important tip: take a peek inside and around the corner when you visit, even if it looks busy. We were thankful that there were additional long rows of seating at the back and we snagged a spot without any issues. Vetters is the kind of place where you can easily socialize with those sitting around you. We met a table of Americans who were visiting Heidelberg on a business trip. It was their last night in town, just as it was ours. It was great to chat with a friendly group over delicious pints. 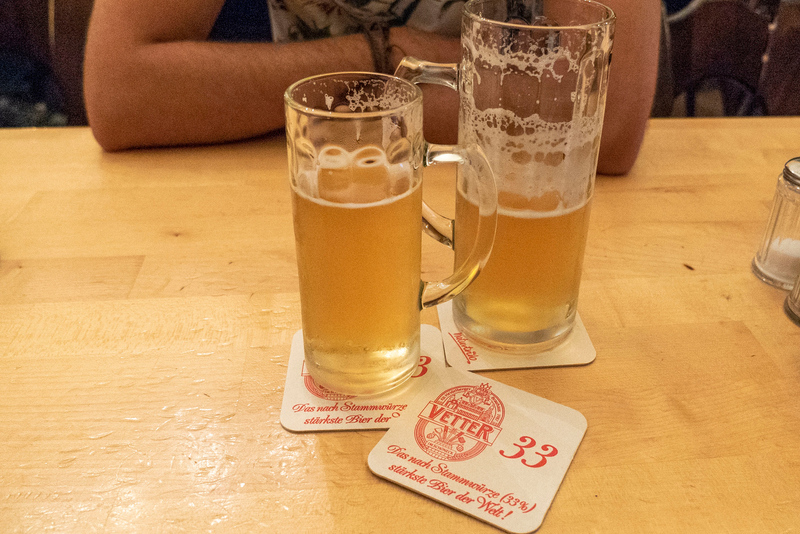 Justin and I both tried the classic Brauhaus Lager and we weren’t disappointed. Though I’ll be putting together a more extensive vegan guide to Heidelberg soon, we had no issues finding plant-based meals here. There are numerous vegetarian restaurants or establishments with vegan items on the menu. 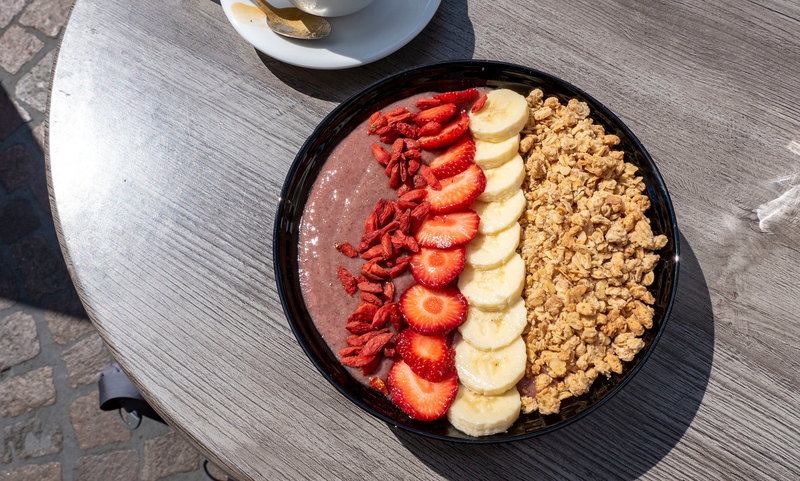 I enjoyed starting off the day with an acai smoothie bowl from Your Green Love, which also happened to be a short jaunt across the square from our hotel. 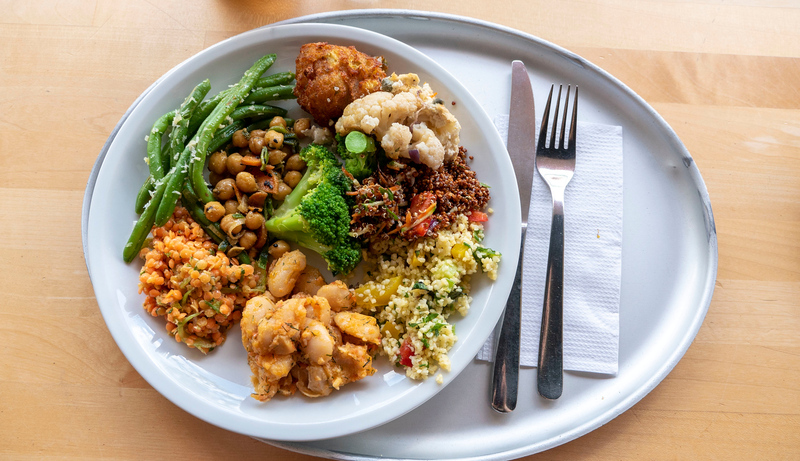 For lunch, pop over to Red where you’ll find an entirely vegetarian buffet with clearly marked vegan options. You pay by weight at this restaurant, and there’s a fridge full of sweet treats for after your meal. Justin and I scooped up various salads, veggies, and side dishes for an entirely delicious plate of food. For dinner, you have a few options, including burgers and Asian inspired meals. 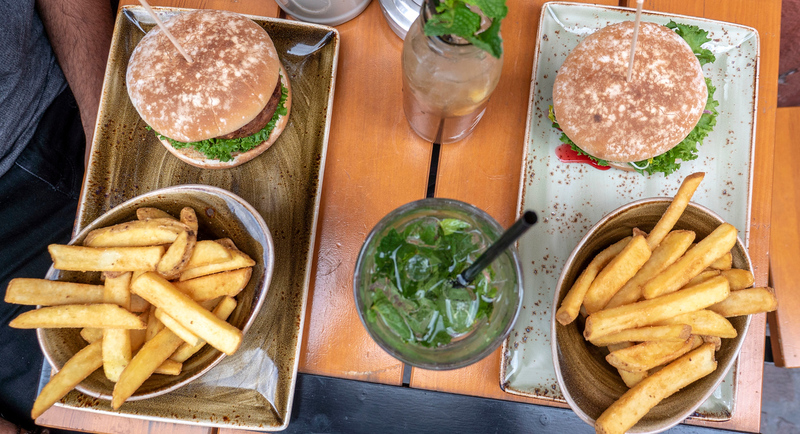 Check out Hans Im Gluck, a German chain of restaurants, if you’re feeling like a veggie burger. They have four different vegan burgers and intriguing cocktails, in addition to classics like fries and beer. L’atelier Heidelberg is a Vietnamese restaurant that takes pride in offering vegan food, as it’s clearly displayed on their signage and menu. 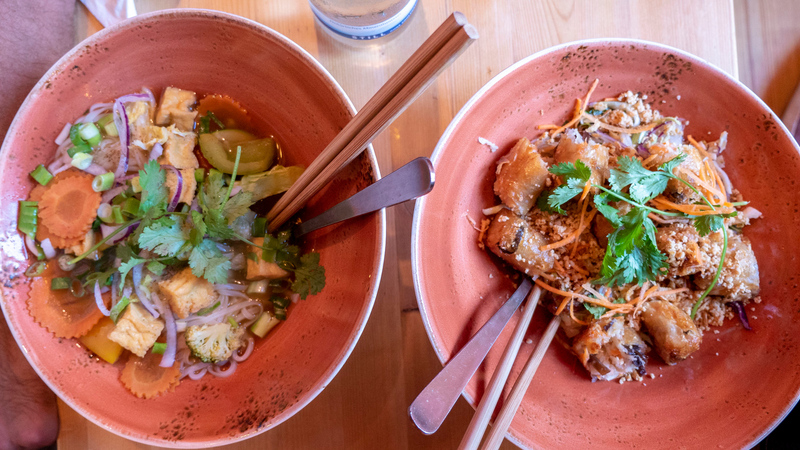 From noodle bowls to spring rolls and soup, you’ll leave here feeling full and satisfied, no doubt! You can’t get a better location than this! 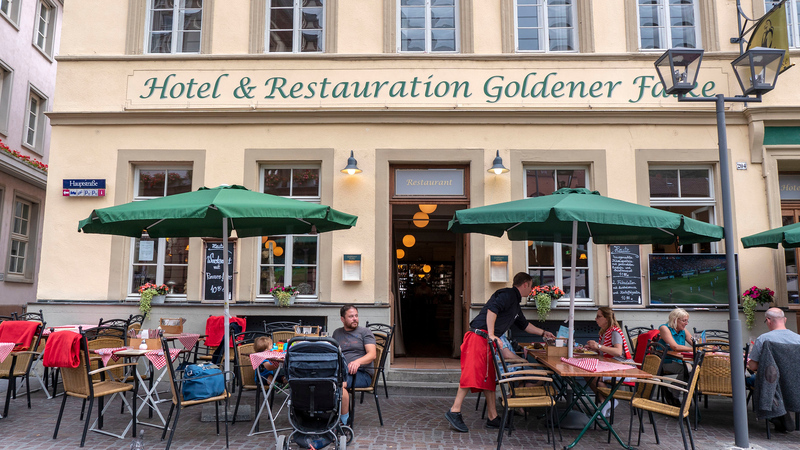 We stayed at Hotel Goldener Falke, right in the heart of Old Town. 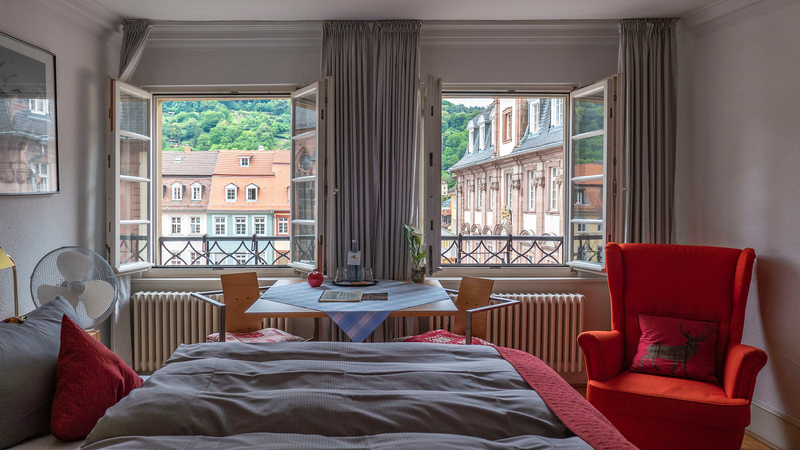 This accommodation in Heidelberg is located on the upper floors above a restaurant overlooking the Market Square. From our room, we could see the Holy Spirit Church, the town hall, and the lively town plaza. 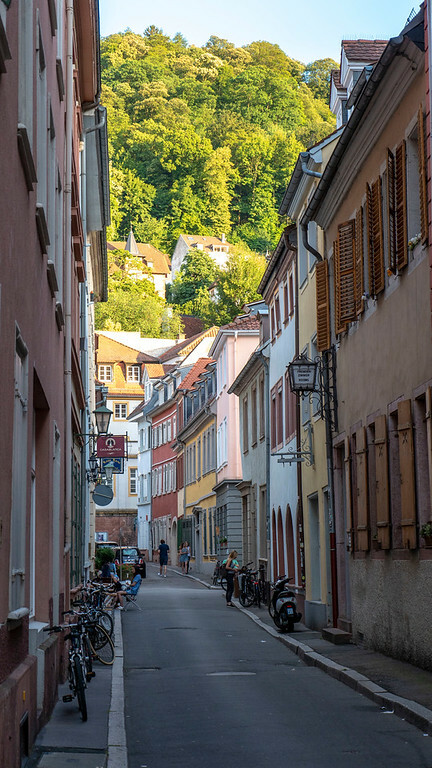 We walked absolutely everywhere in town, whether it was to the Phliosopher’s Walk, all around Old Town, or to the funicular to Heidelberg Castle. Our room at the Hotel Goldener Falke was spacious, comfortable, and a calm place to spend after a lengthy day of exploring. Even though we were facing the square, our room was quiet every night. We adored the charm of this historic building with clean and modern decor throughout our room. The property comes with complimentary Wi-Fi and a flatscreen TV. There was a buffet breakfast with coffee in the restaurant each morning. I adored sipping my coffee at the kitchen table in our room, watching the rest of the town wake up. Click here to read the reviews of fellow travellers who stayed at the Hotel Goldener Falke. Interested to see more photos? 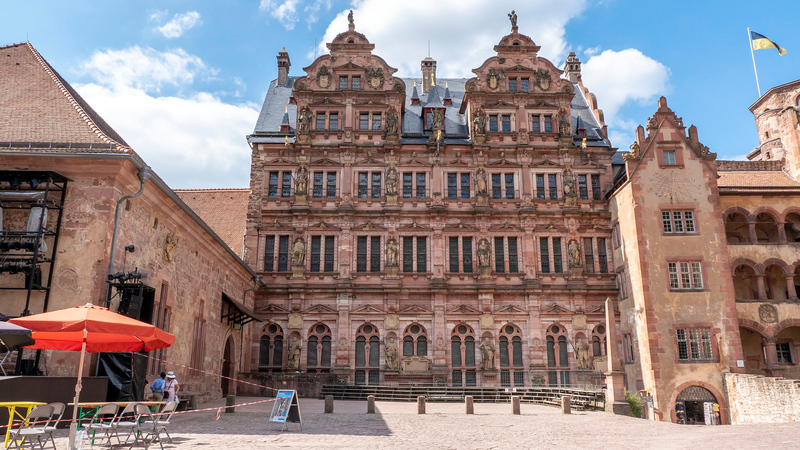 Check out our entire travel photo album from Heidelberg, Germany. You can also purchase prints, canvas wall hangings, phone covers, and more – all directly from our travel photography site. 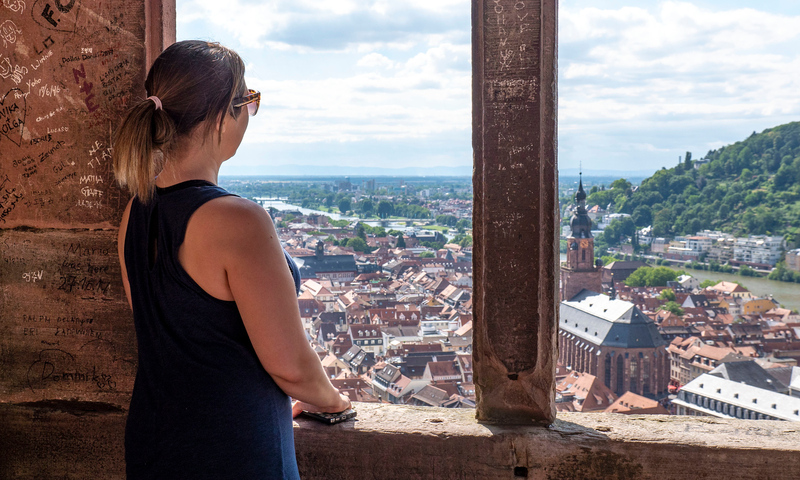 We hope that you enjoyed reading our travel guide to Heidelberg and that it’s sparked your imagination for a trip there. Justin and I love visiting Germany so much, and Heidelberg is a German town that’s very easy to fall in love with. 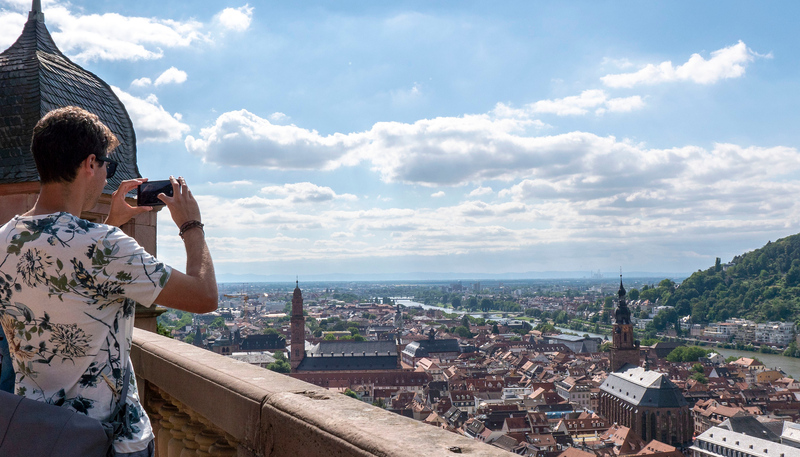 From things to see in Heidelberg to our favourite activities, we hope that this blog post will help you plan your Heidelberg itinerary. Please let us know if you have any questions. Feel free to leave them in the comments section and we’ll be happy to assist you! 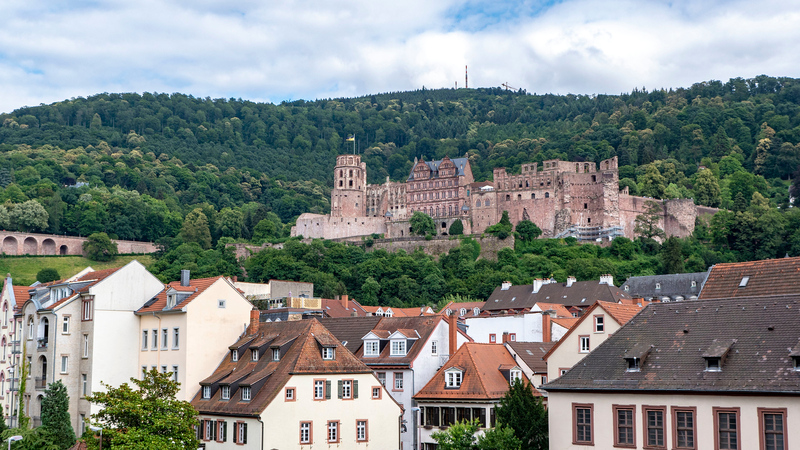 With so many things to do in Heidelberg, you’ll have a spectacular time. Heidelberg is such a captivating city and I am sure we will be back. 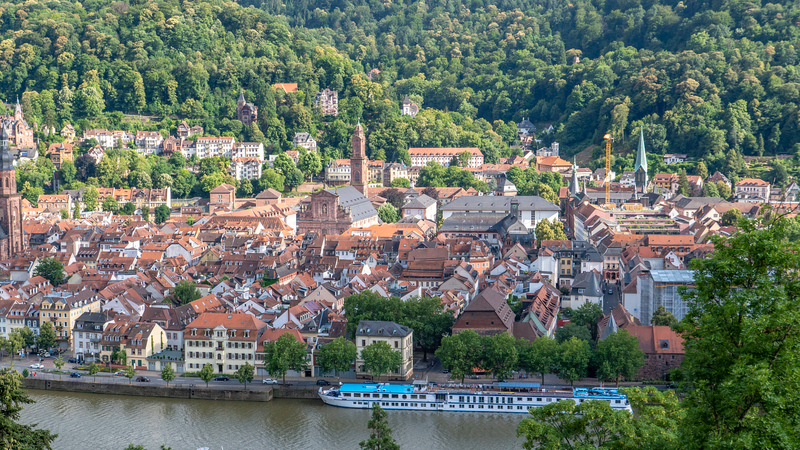 Have you ever visited Heidelberg, and what did you love the most? Germany looks so gorgeous! There is so much to see and do. It looks like a really beautiful drive. You captured awesome pictures on your travel trip. That place looks amazing to visit. Thank you so much for sharing nice experiences with us. Totally outstanding tour guide to Heidelberg. We are off to Europe next summer and I was looking for some ideas of places to go in Austria an Germany. This has really inspired me to add this city to my list. Thanks for bringing back memories of my time I lived in Heidelberg. I loved the Philosopher’s Walk with the view of the city and the castle. Unfortunately no Heidelbonbons and street art in the eighties. A reason to go back again. Having studied and lived in Heidelberg for 20 years, it truly warmed my heart to read your excellent description of my old stomping grounds. There is a famous, age-old song “Ich hab mein Herz in Heidelberg verloren” (In Heidelberg, I Lost My Heart) – which the band at our wedding played for us. My daughter was born in Heidelberg, in 1989, as we watched the Berlin wall came down on TV that fall. You mentioned exotic plants growing in Heidelberg, so here’s an interesting tidbit: on the castle grounds, there was once a huge, 200 year-old oriental gingko tree, which turns golden yellow in autumn. It is special, because its heart shaped leaves inspired Goethe to the famous poem “Gingko Biloba” he dedicated to the noble, yet married woman he deeply loved, Marianne von Willemer. He sent her the poem along with a leaf of the tree. He then fled her company before it came to an affair. He went on to plant ginko trees in various castle locations all over Germany. The one in Heidelberg no longer stands (since 1936), however, there is a statue of Goethe, with a plaque, commemorating his poem. Thank you for your guide. I hope you go back to Heidelberg one day!